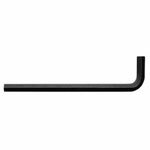 All hex keys are precision formed to exact tolerances for precise fit. Resists rotational distortion. Key Type: Hex; Size: 12 mm; Length: Long; Material(s): Steel.